“Well, I killed her demon husband. 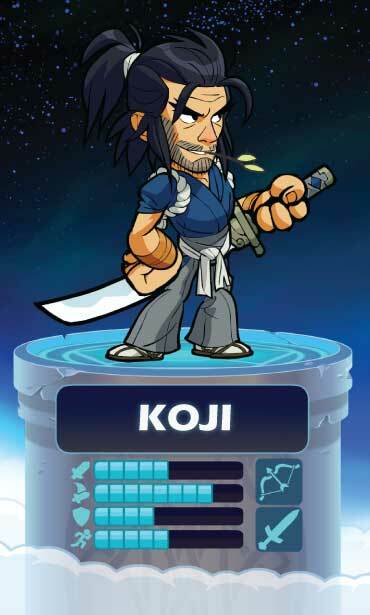 So…it’s complicated.” – Koji when asked about the ninja Hattori. As the second son Koji knew he would never take over his father’s school or inherit the coveted family sword. He spent his days determined to make his own technique, one without a silly made up name. One day that changed. Fearful of the “School of the Demon Slaying Sword” a corrupt Shogun ordered Koji’s father and all his students slain. To save their legacy, Koji was ordered to take ancestral katana and flee, keeping it safe at all costs. After many patient and careful years he was ready. Seeking an audience with the Shogun he revealed his name and petitioned to reinstate his family’s place. The twisted Shogun only laughed. Knowing his fate was sealed, Koji leapt across the hall and cut him down. The stunned chamber guards fell next. As Koji caught his breath, the palace alarm sounded. A slight man with red eyes walked out of the shadows. Introducing himself as a fellow second son, the younger Kagima offered Koji a way out. Power untold and a guaranteed escape, and all he needed to do was part with the family blade. Koji examined the sword, remembering the stories his father told him as a child. He smiled. When the 3,000 guards entered the chamber they found the demon’s head lying on the floor and Koji rushing toward them, cutting his path to Valhalla.